Apples of Gold Jewelry brings you this stunning 14K white gold sculptured V bar necklace in 16 - 18 inches. This beautiful necklace has a fresh new take on bar necklaces, with a V shape replacing the rectangular bar shape that is so popular with bar necklaces. 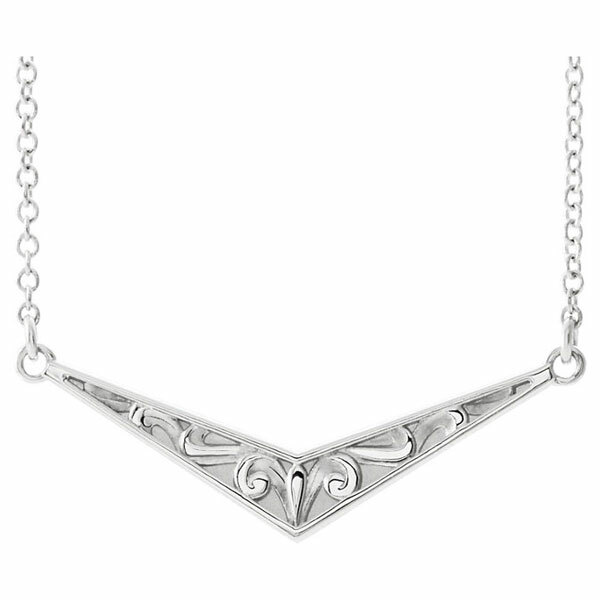 14K white gold V shaped pendant features a paisley like design on it's middle, with a plain white gold border along the outside of the V. The pendant measures just over 1" wide by 3/8" tall. On either side of the V is a hoop where the chain attaches to the pendant. The chain, which is a 1mm cable chain with a spring-ring closure, is available in your choice of 16" or 18" in length. We guarantee our 14K White Gold Sculptured V Bar Necklace, 16 - 18 Inches to be high quality, authentic jewelry, as described above.